In a recent article, writer George Dvorsky suggested that we should turn our attention to Venus as our first choice for terraforming one of our solar system's planets (rather than Mars). Fifty years ago, Carl Sagan suggested that we use atmospheric-based GMO algae to convert the CO2 into something more benign or useful. It's not the greatest idea in the world, but give him credit — he was the first person to seriously suggest that we terraform Venus. 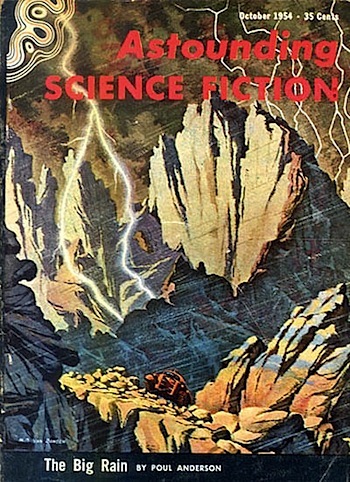 Perhaps inspired by Poul Anderson's short story entitled “The Big Rain,“ published in 1955, Dr. Carl Sagan in 1961 proposed a terraforming project to modify the environment of Venus. Our sister planet has a hellish climate, with temperatures upwards of 750 °C and pressures of 90 atm at the surface. To prepare it for human habitation it will be necessary to lower the surface temperature and pressure, and to elevate by at least two orders of magnitude the fraction of molecular oxygen present in the atmosphere. Most of the air is carbon dioxide, and this must be eliminated as well. How reasonable is the astronomer's proposal? Meanwhile giant pulverizers were reducing barren stone and sand to fine particles which could be mixed with fertilizers to yield soil; and the genetic engineers were evolving still other strains of life which could provide a balanced ecology; and the water units were under construction. At the right time, hydrogen bombs were to be touched off in places the geologists had already selected, and the volcanoes would all wake up. They would spume forth plenty of carbon dioxide,,, there would be water too, unthinkable tons of water. And simultaneously aircraft would be sowing platinum catalyst in the skies, and with its help Venus' own lightning would attack the remaining poisons in the air. They would come down as carbohydrates and other compounds, washed out by the rain and leached from sterile ground. A hundred years after the airmen had finished their work, the reclaimed sections might be close to Earth conditions. In five hundred years, all of Venus might be paradise. Anderson further proposed that ground-based airmakers would be useful in the work of terraforming Venus. By the way, the word terraforming was coined by science fiction writer Jack Williamson in his 1941 story Collision Orbit. So, was Carl Sagan preceded by science fiction writers by six years? Actually, no; I found an earlier source. It appears that science fiction writers (and science fiction readers) were well out ahead of the scientists this time. Read George Dvorsky's article Should we terraform Venus first? and the Xenology article; thanks to Winchell Chung of Project Rho for suggesting the article and providing references. I'd also like to point out that I've turned comments back on and the contact form is also open, so if readers have earlier references, please let us all know!